Companies and customers want to choose the communication channel they prefer to deliver and receive their business-critical information. Research shows that a rapidly increasing number of customers prefer digital communications. ConnectSuite e-Preference is a simple, yet powerful, cloud-based solution that helps companies manage those preferences and maximize their ability to easily send critical customer communications through traditional mail or via a digital channel. Determining a digital communication strategy while maintaining physical mail delivery can be a daunting task for any company.. ConnectSuite e-Preference can handle this by managing the entire e-consent process, driving adoption through automated opt-in campaigns, evolving your customer to electronic delivery. When recipients select their preferred delivery method ConnectSuite e-Preference saves their preference. Coupled with OMS-500 and Neotouch, ConnectSuite e-Preference automatically sends documents physically through traditional mail, or electronically through email or SMS text. Using the proven “PUSH” email delivery method, migrate your customers from paper-based communication to electronic delivery – dramatically increasing paper suppression. When using OMS-500, Neopost’s flagship Output Management Solution, send communications to your printer, or via email through your local email server. Use Neotouch as an alternative to traditional and electronic mail. With Neotouch, send your communications to a state-of-the-art production facility to print, fold, insert and meter your mail, which is then delivered to the post office, or have Neotouch send your documents via email, SMS text, or fax. 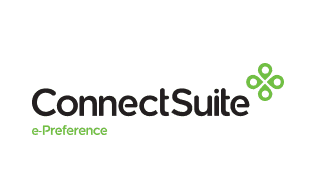 ConnectSuite e-Preference, seamlessly integrates with these best-in-class Neopost solutions to send your business communications.